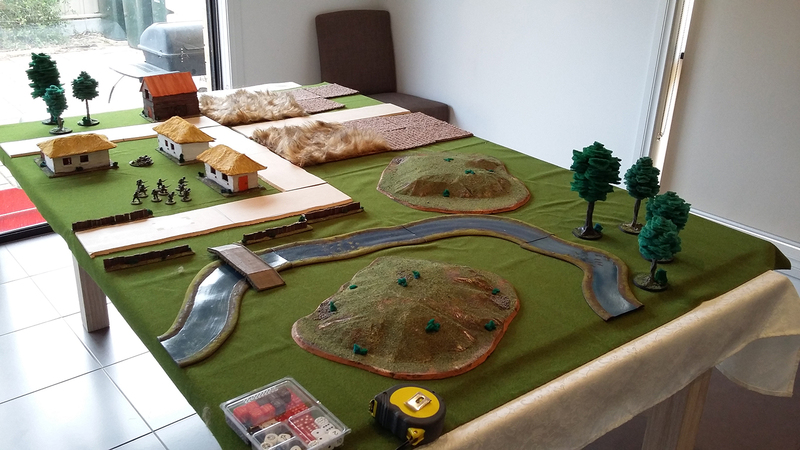 I had a Remembrance Day game of Bolt Action against a mate this week for Warfare Wednesday. We have decided that we will endeavour to play fortnightly on Wednesdays and we’ll change up the game and theatre of battle in sequence. 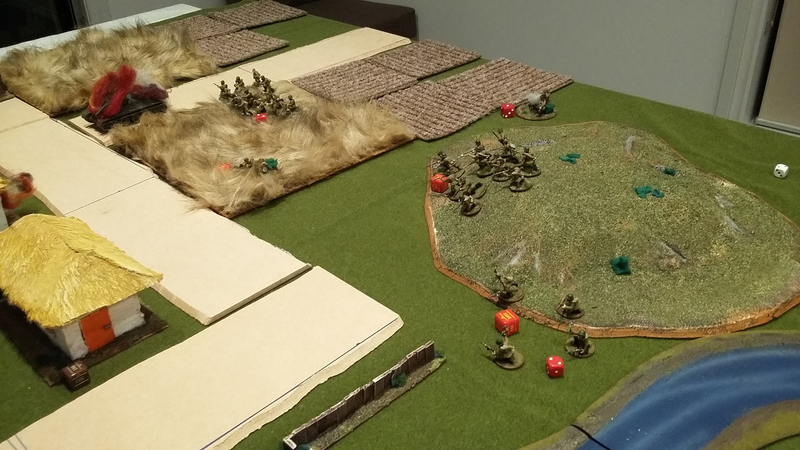 It was decided that last fortnight’s game will be the first of three of Bolt Action on the Eastern Front. 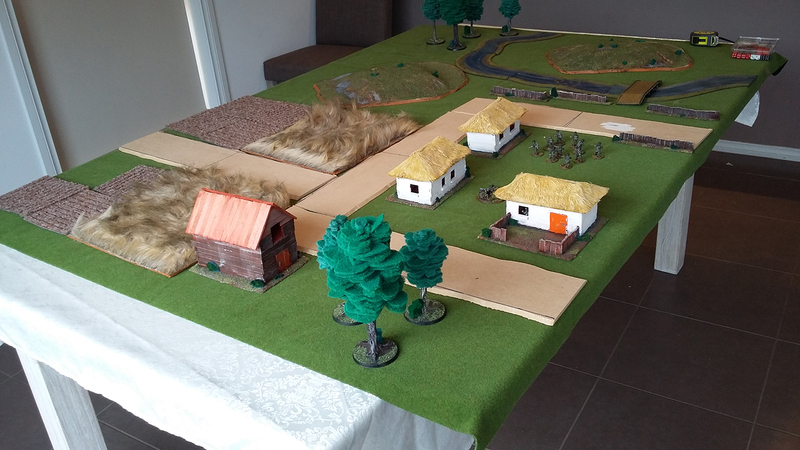 With the lists being drawn from Operation Citadel (German) and Battle of Kursk (Soviet), it’s quite a nice little mini-campaign to break us in on the Bolt Action rules. To make things interesting the loser will be buying the winner sushi and sake at a sushi train restaurant in the city to the value of $20 (approximately 2-3 plates of sushi and one cup of sake). Given I lost last fortnight, I was very eager not to lose on Wednesday and have the mini-campaign decided so soon! We used the same forces as last fortnight. Our first game was Maximum Attrition and with the German loss, it put me on the back foot so Envelopement was chosen for this game. 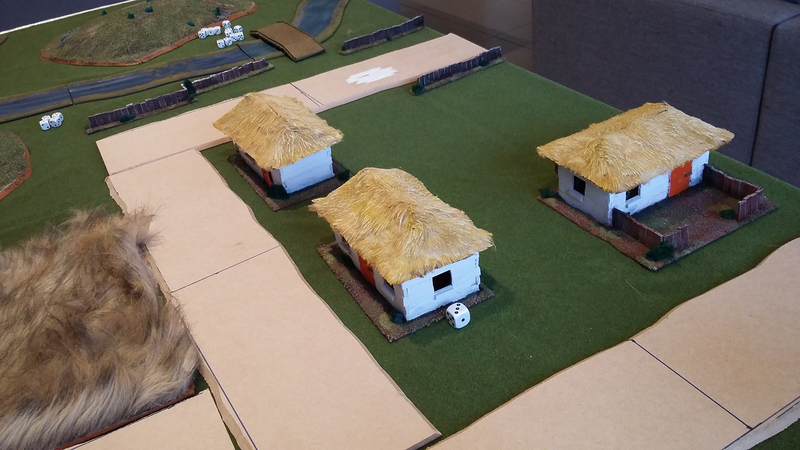 Half the German force began deployed defending the village side of the field. As the defenders, the Germans would score 2 points per enemy unit killed. 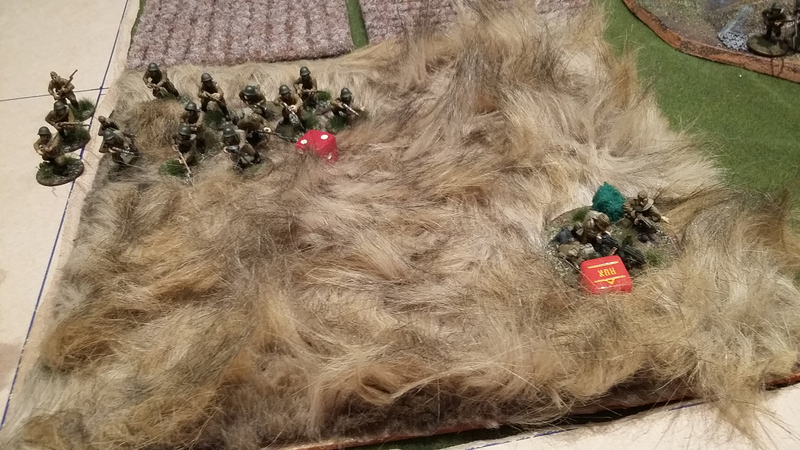 The Soviets as the attacker would score 1 point per unit killed, 2 points per unit that ended the game in the German deployment zone and 3 points for each unit moved off the German deployment edge. 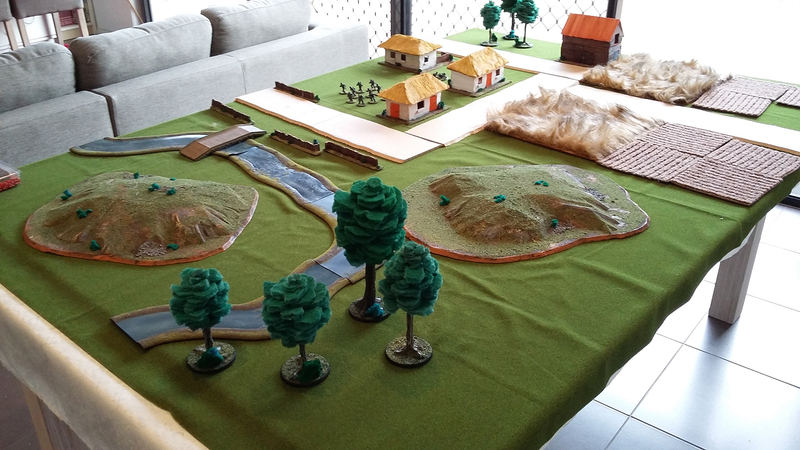 Above you can see the battlefield with my forces already deployed. One Grenadier squad behind the house roughly in the centre, the MG behind the house left of that and my HQ is hiding in the rear house. The Soviets began with their preparatory bombardment, which was successfully called in and inflicted 2 pins on the Grenadiers, 1 on the MMG and nothing on the HQ. The rest of the turn was then spent moving things. My MG and Grenadiers both ran into their respective houses while the rest of my force (HQ included) went down (units in reserve must go down till turn 2 in this mission). The Soviets ran on, from my left to my right, their HQ, an LMG squad, T34/76 (which advanced, fired and missed the MG), an LMG squad behind the T34, an LMG squad into the field, the Maxim, the Mortar (kept at the back), rifle squad behind the hill and the SMG squad on my far right. 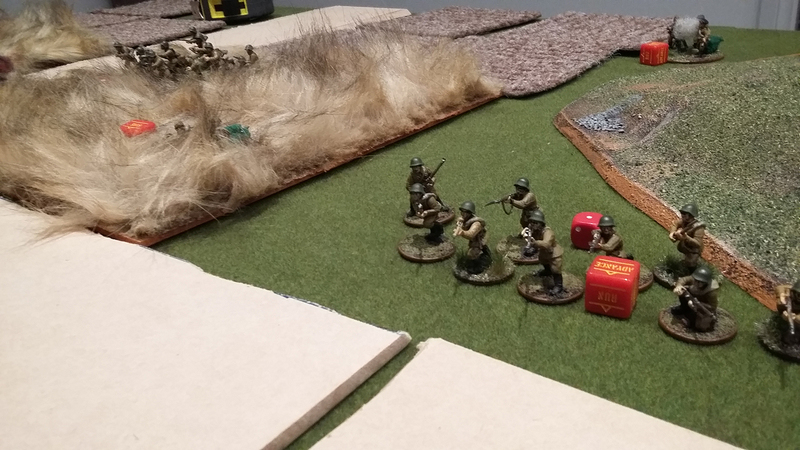 Turn two and the Soviets pulled the first dice, which was given to the mortar team. It lobbed a shell at my MG, again. 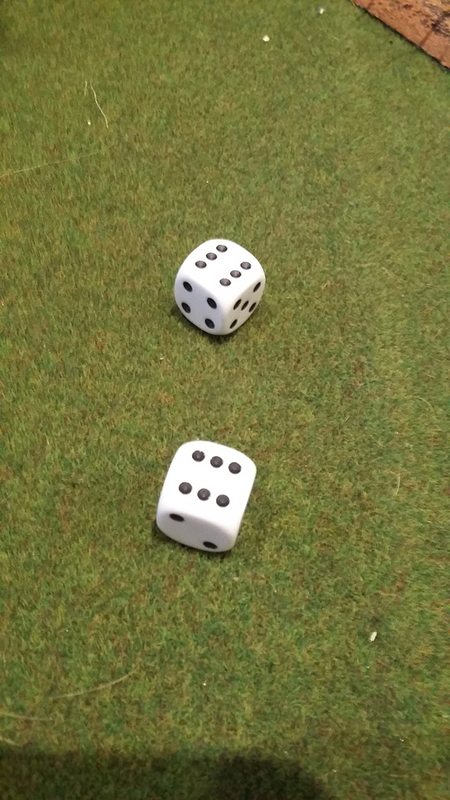 It rolled a six, again. It rolled six hits, again. It obliterated the MG, again. (If you haven’t read the first AAR in this series, this happened last game, except we forgot about the Fixed weapon rule, this time we remembered and it still happened!). 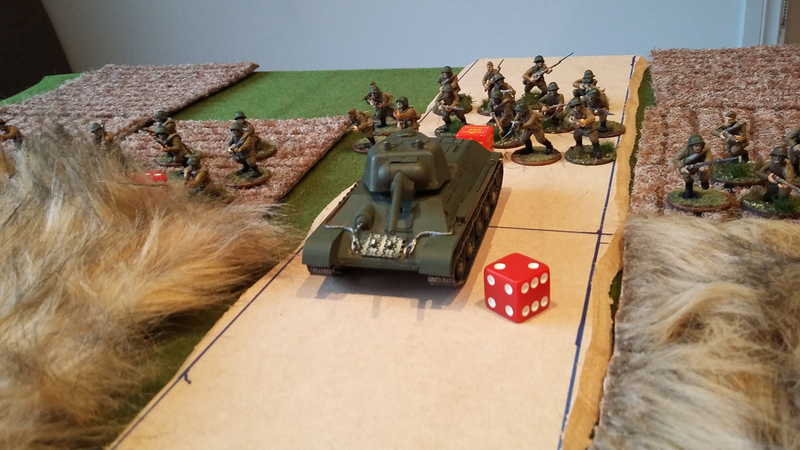 The T34 then moved up and fired on my grenadiers, but missed. 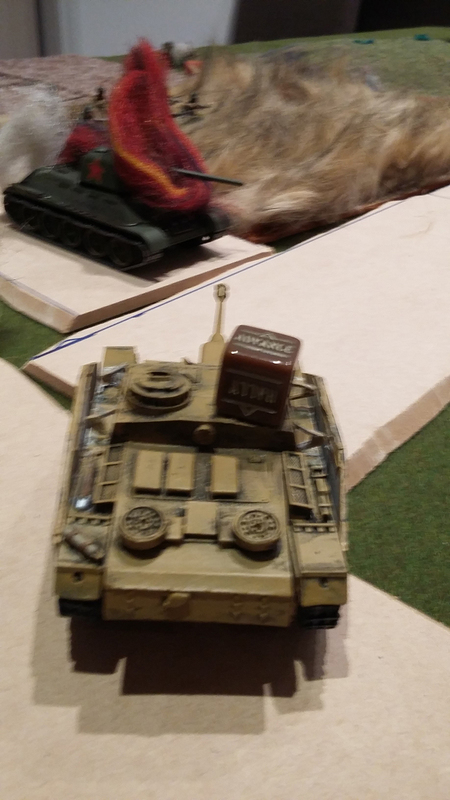 I then pulled a dice and called on my Stug. 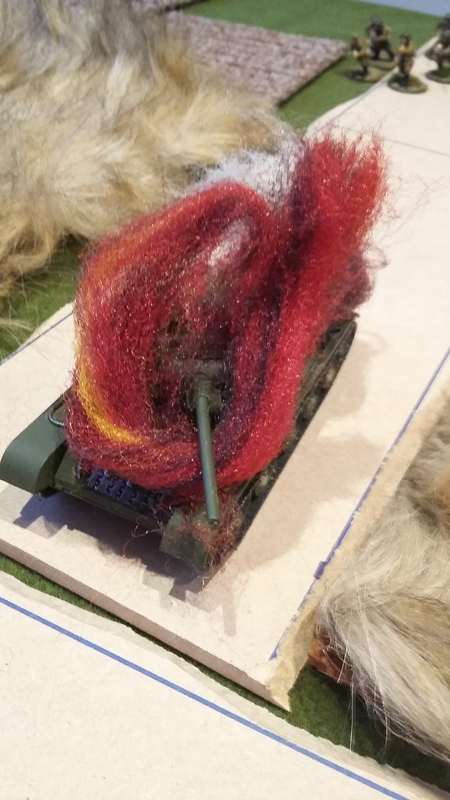 It trundled on and opened fire on the T34, hitting it, rolling a six to score a penetrating hit and setting it on fire. 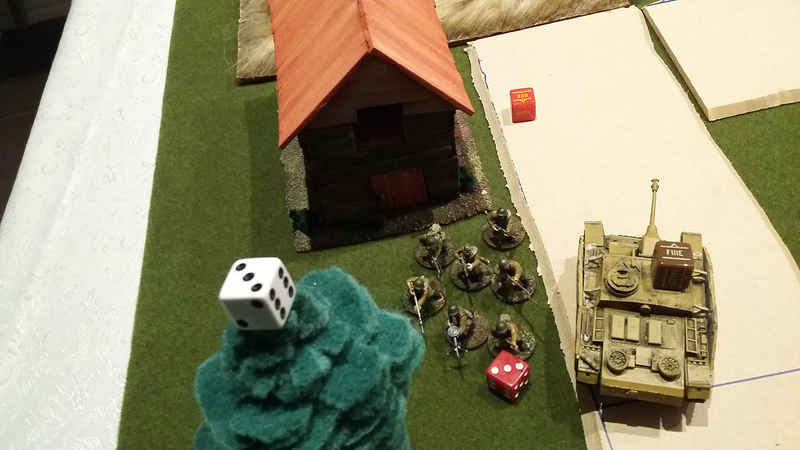 The crew then failed their morale check and bailed from the vehicle – a kill that more than made up for the loss of my MG, especially because the only other Soviet anti-tank capabilities were on the other side of the field! Most of the rest of the turn was spent moving things up, mostly via running them. Both my other Grenadier squads came on, with the one on the right opening up on the SMG squad opposite and causing significant casualties. My squad in the house fired on the LMG squad in the field, but only picked one or two off. 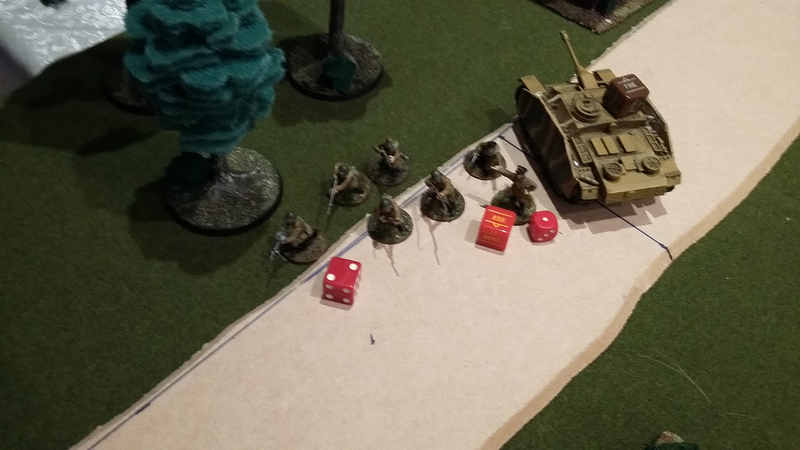 Turn three and the Soviet HQ and LMG squad on my left continued to run up, skirting around my Stug. The Stug opened up on them and killed a few. The mortar tried to pin the Stug, but failed. In the centre the LMG squad assaulted my Grenadiers in the house and after a bloody combat took it – only two men remained (although you may note from images that some men were accidently left in the centre of the field, so 5 may have actually survived, it’s not clear what happened but they were later removed when we realised). The SMG squad continued to take a beating and went down after being reduced to four men, but didn’t flee. 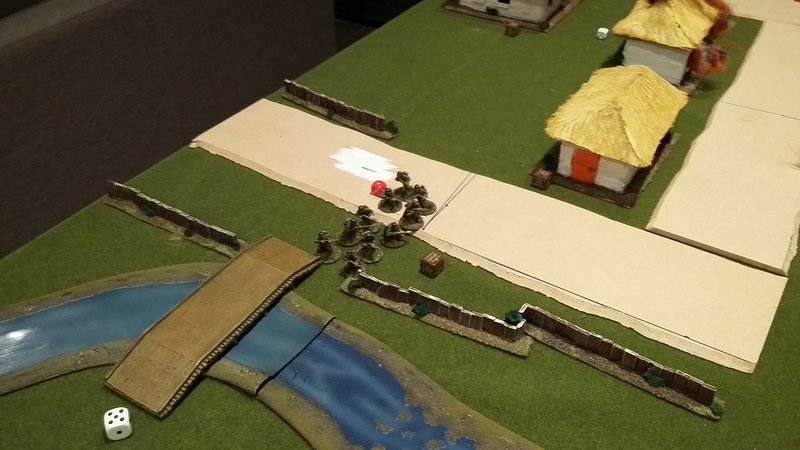 The rifles moved up and with some sharp shooting took out some Grenadiers on the road. The Maxim and last LMG squad moved up into the centre field. 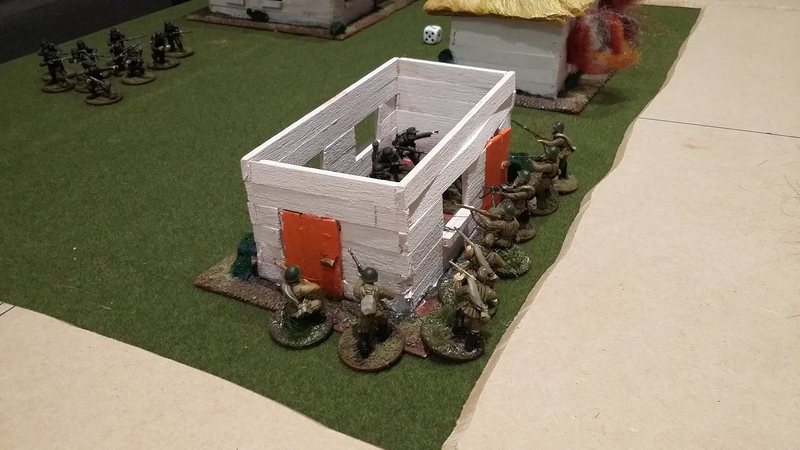 My other Grenadier squad conducted a counter assault on the Soviets in the house and re-took it without loss. Turn four and on my left the Soviet HQ and LMG squad continued to move up. My Stug and HQ did little to them, but added pins which I hoped might be enough to stop them running off the board edge, even if there weren’t many of them. 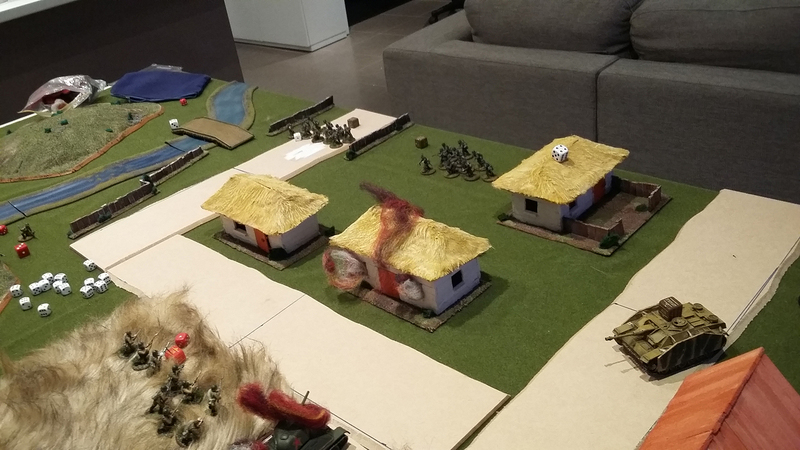 The rifle squad in the centre advanced and shot at my Grenadiers on the road, who wiped out the SMG squad. The mortar also picked off a few grenadiers on the road. In the centre the Maxim and LMG squad were ineffective against the Grenadiers in the house, who shot at and inflicted a couple of casualties on the rifle squad – who became regular as a result of their Green test. 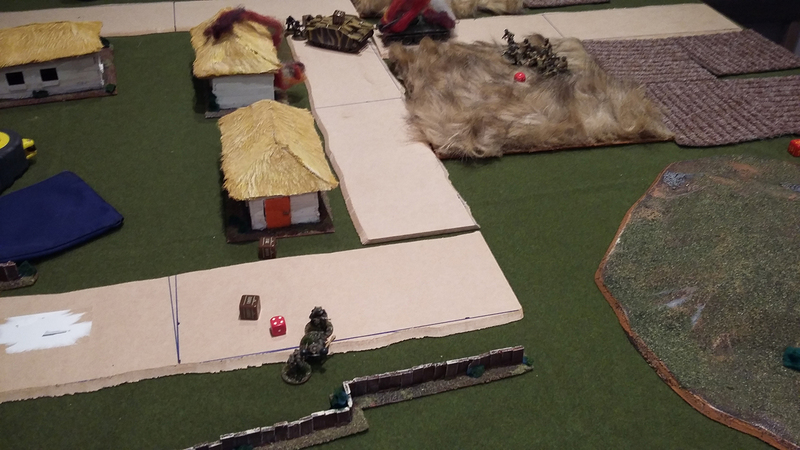 Turn five and the Soviets got the first dice and got their LMG squad off the table. I then proceeded to ignore the HQ – thinking the pins I put on it would be enough. My grenadiers on the road went down failing an order test to fire. The rifle squad assaulted the Grenadiers on the road, but this ended very badly for them and the Grenadiers won with four men remaining. 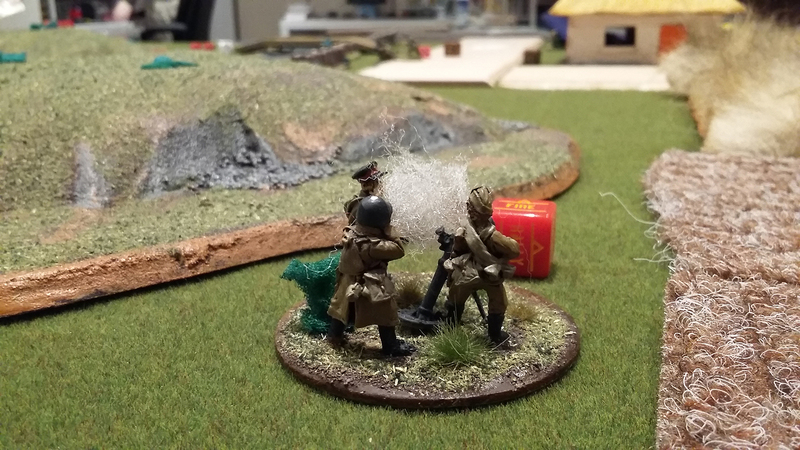 My mate realised his folly of not using his mortar to shell the squad first, but when it did on the next order dice it only caused a casualty and a pin. The HQ then passed its order test and got off the board, the Grenadiers in the house shot at and killed a man on the Maxim. My Stug then turned and advanced and finished the Maxim off. 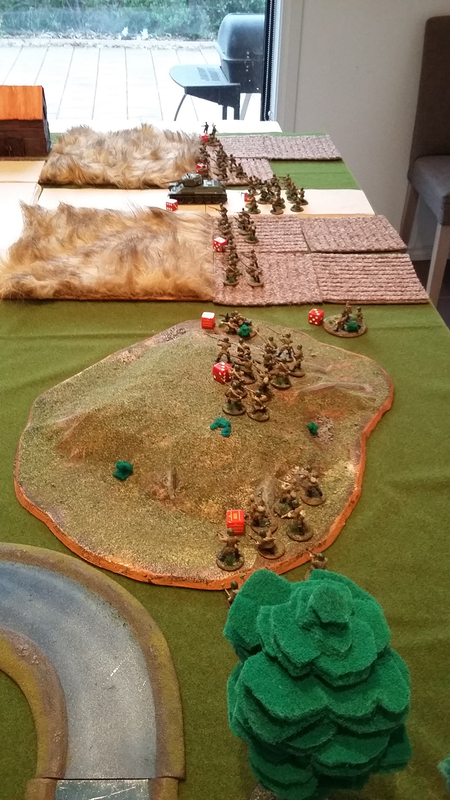 The potential final turn of the battle and some ineffective shooting transpired. 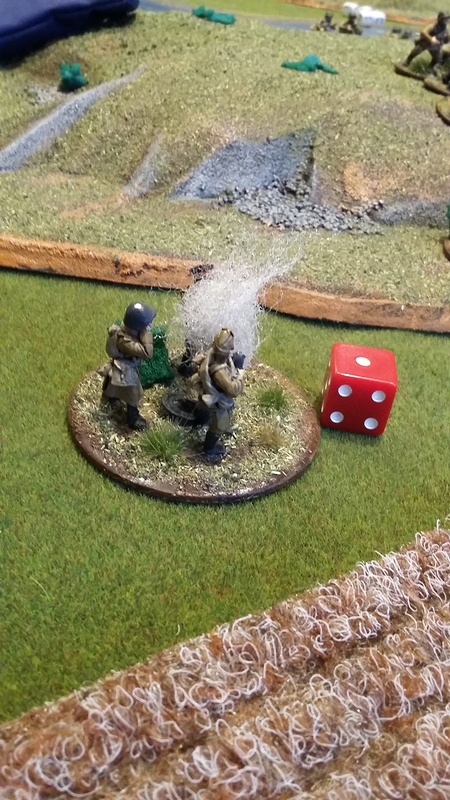 The mortar failed to finish off the Grenadiers on the road, once again scoring minimal hits and casualties. 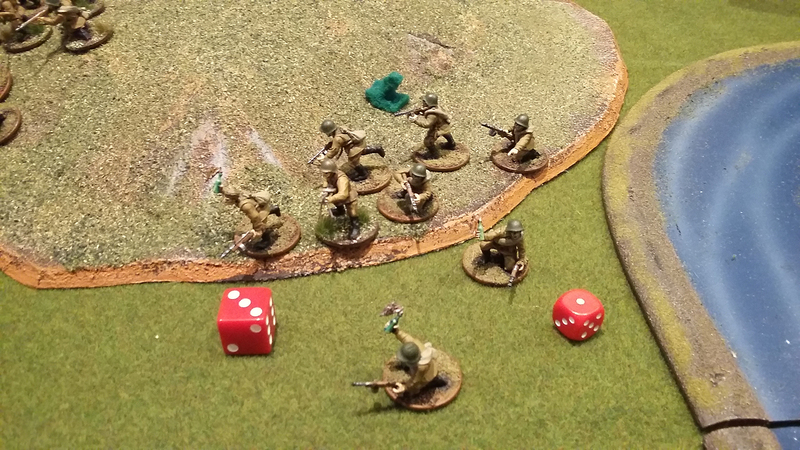 Meanwhile my other Grenadiers shot and missed, while my Stug put a pin and a couple of casualties on the LMG squad. My HQ moved up behind my Stug in case of a turn seven, but we rolled and it was not to be. 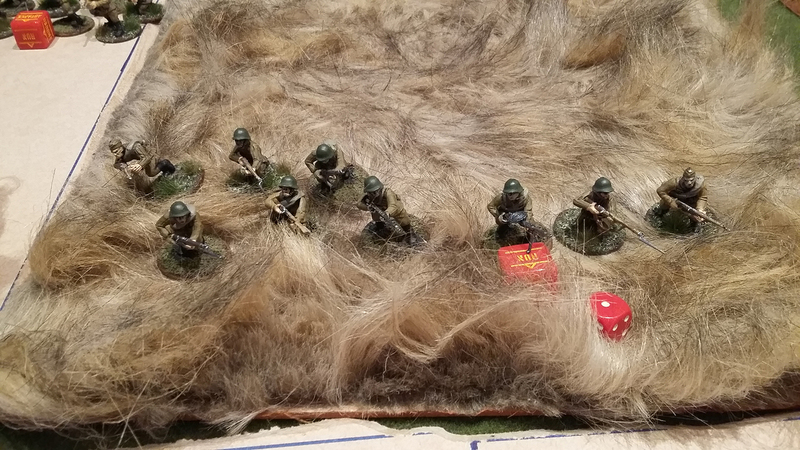 The Soviets had killed two German units and moved two units off the table for a total of 8 points. 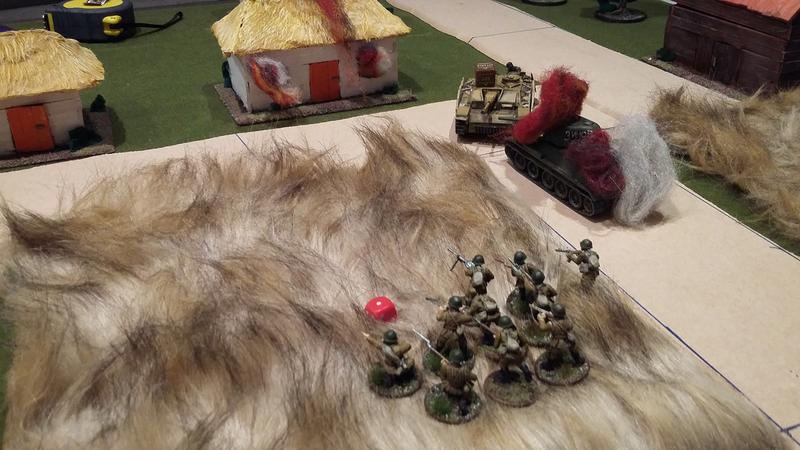 In response the Germans killed five Soviet units (T34, LMG squad, SMG squad, Rifle squad and the Maxim) for a total of 10 points. 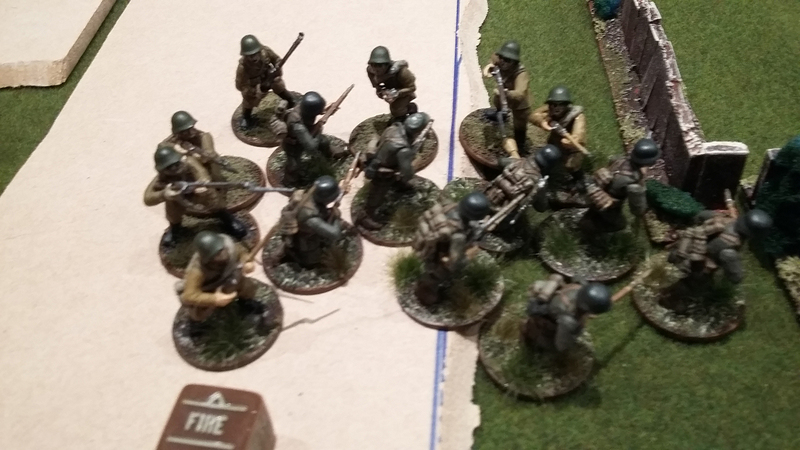 With the required two point lead, the Germans scored a clear victory. Next Wednesday fortnight (28 November 2015) we will play the final game for this series of three. The mission we will use is Top Secret (I think? ), representing the Germans being caught up in the Soviet counter attack after the order to withdraw with the cancellation of Operation Citadel. 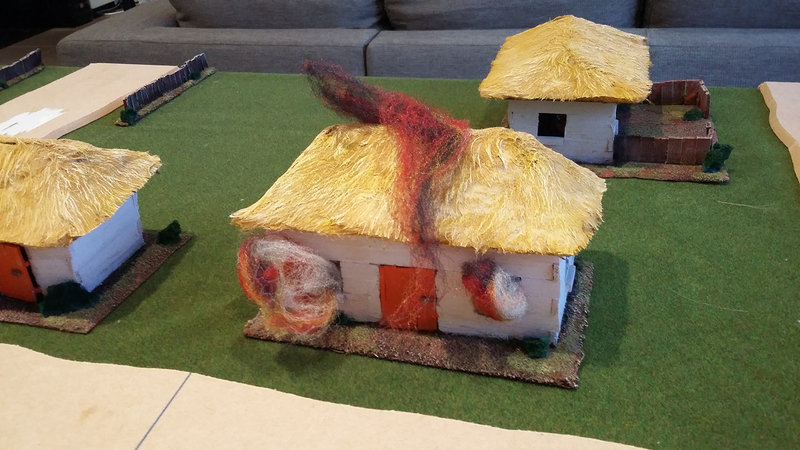 It will take place in a village or small town and I’m hoping to change the lists up a bit (provided things I’ve ordered arrive before Friday next week) and have a few new terrain pieces to use (a rural Orthodox church and some more houses). It will be the deciding match and to the winner will go the sushi and sake! 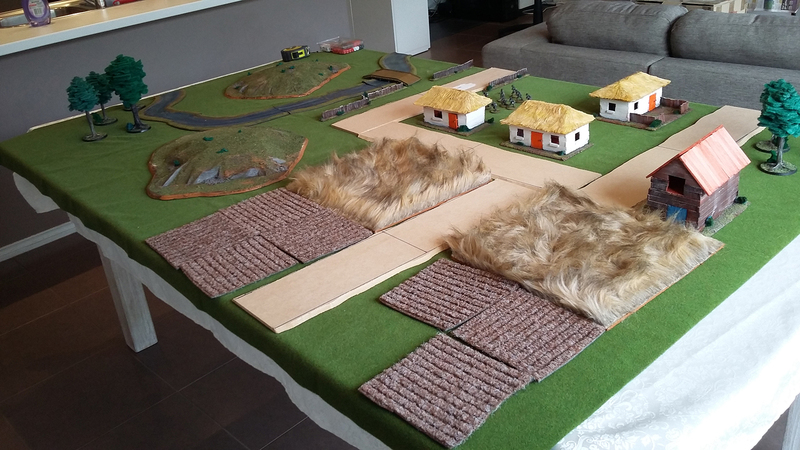 The mini-campaign to follow will be a three game set of Flames of War in North Afrika (where Lebanese food or similar will be on the line) so there is plenty to look forward to.